Continuing my exploration of Jim Beam’s range, it’s interesting that they have focused more on bourbon-based drinks rather than the normal approach of producing a range of different aged or finished offerings. This is Devil’s Cut, a 45% ABV bourbon with a twist. You may be familiar with the “Angel’s Share” – the term used to describe the portion of whisky lost through evaporation as it ages in the barrel. The exact proportion lost varies heavily with the environment, and can add up to a significant amount (the main reason, incidentally, that you won’t find massively aged whiskies from warmer climates). 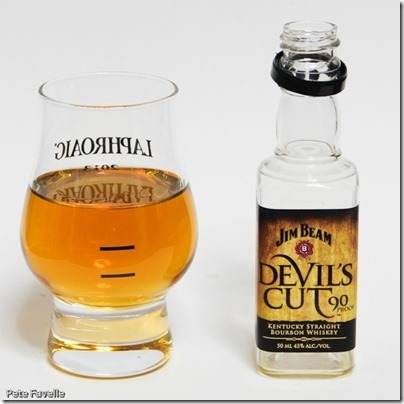 Jim Beam have introduced me to another of these losses, in the form of the “Devil’s Cut” – the whisky which soaks into the wood of the barrel and is therefore traditionally lost to the distiller. They have developed a “proprietary process” to recover this lost whisky, blended it with some of their usual product, and bottled it. As a Scotch lover, a part of me can’t help but be concerned by this development, as the Scotch industry relies heavily on used bourbon casks, but hopefully they won’t apply their process to all their barrels! So enough about the process; how does the resulting bourbon turn out? The nose is sweet and rich, with a creamy vanilla edge and more wood apparent than in regular Jim Beam. To alcohol, too, is significantly more obvious in the aroma. Watered, the sweetness is reduced and the wood enhanced – it actually starts to smell closer to a Scotch than a bourbon. In the mouth, the alcohol kick is surprisingly heavy for a 45% spirit and it’s right there on the tip of the tongue along with a strong black pepper spice. Underneath there’s just a touch of honey and some raw grain but it’s all dominated by the spice. And just as you’re starting to taste it, it’s gone – it has to be one of the shortest finishes I’ve ever encountered in a whisky. Water cuts the alcohol back and allows some other flavours to shine through; spice again, but not as harsh now, a touch of butterscotch and the wood slowly emerges. There’s still a rough edge to it but it’s well balanced by the sweetness and the tannins from the wood. Happily, the water also extends that finish into a pleasant, lingering spicy tingle. Neat, it’s pretty harsh and out of hand with that curiously short finish but with just a touch of water it turns into an interesting dram that earns 3 stars. Many thanks to Jim Beam for providing these samples!